NOW THAT the Russians have finally backed out of the deal to supply India with cryogenic rocket-engine technology, Indian space scientists face their biggest technological challenge ever. With more countries wanting communication facilities, satellite launching promises to be big business in the highest of high-tech leagues. The US, afraid of competition and claiming India has ulterior military motives in acquiring cryogenic engine technology, has arm-twisted the Russians into leaving India out in the cold (See box). The cancellation is bound to be a setback to India's hopes to enter the space-launch market by 2000. Indian Space Research Organisation (ISRO) scientists say the cryogenic engines are essential for powering the geostationary launch vehicle, which will boost satellites weighing 2.5 tonnes into space. "Even one foreign order for building and launching a satellite," an ISRO scientist explained, "will fetch us $100 million." The lucrative prospects in space launches can be gauged from the fact that the European space agency, which launched India's INSAT-2B last month and averages one launching a month, is booked for three years. The question is: Can Indian scientists, on their own, develop the capacity to launch communications satellites into the prestigious geostationary orbit, 36,000 km above the earth? R Narasimha, former director of the National Aerospace Laboratory (NAL) in Bangalore and a member of the Space Commission, is buoyant about India's prospects. He says, "If we have the will, focussed attention and sufficient time and money, our scientists can develop cryogenic technology." But he admits, "It will not be easy." Most scientists and engineers associated with the Bangalore-based ISRO are also confident that Indian scientists can develop cryogenic engine technology or find alternatives to place large satellites in geostationary orbit. Way back in the 1980s, then ISRO chairperson Satish Dhawan had warned the government, "Already crowded by communications and other satellites, the (geostationary) position is likely to become very difficult for latecomers in the next five to seven years. As things stand, the first-come-first-served principle for regulating satellite parking space has worked in favour of nations that have the wherewithal to launch and occupy slots." What Dhawan meant was that there is only one orbit in which communications satellites can be placed and because of interference problems, the number of slots in that orbit are limited. Therefore, it was important for India to develop know-how to launch communications satellites. Till now, India has paid commercial rates to other countries to launch its communications satellites. In order to develop its own satellite-launching capabilities, India embarked on a rocket development programme in the early 1970s. India's first successful satellite launch vehicle -- the SLV-3 -- was launched as early as 1980. Subsequently, the augmented satellite launch vehicle (ASLV) was sent up. Plans to place bigger satellites in higher orbits led to research on the polar satellite launch vehicle (PSLV) and the geostationary satellite launch vehicle (GSLV). Polar orbit India will use its first PSLV later this year to put a one-tonne remote-sensing satellite into a polar (or sun-synchronous) orbit, about 1,000 km above the earth. However, to raise communications satellites requires far more powerful rockets, such as the European Space Agency's Ariane, which recently placed the two-tonne INSAT-2B in the geostationary slot. The first flight of the GSLV was scheduled for 1995-96. The GSLV is based largely on the PSLV, but includes a cryogenic engine in its upper stage. Russia had agreed to supply two cryogenic engines and transfer the know-how for the engines, but its back-tracking has disrupted the GSLV programme. It was the scientists at the Vikram Sarabhai Space centre in Thiruvananthapuram -- the ISRO lead centre in developing launch-vehicle technology -- who perfected the production of solid rocket fuels and launch vehicles like SLV-3 and ASLV. The 128-tonne, solid-fuel booster used in the first stage of the PSLV is the third-largest of its type in the world. With the initiation of the programme to put heavy satellites in high orbits, the need for liquid fuels was felt. Liquid fuels provide a higher specific impulse (energy per unit of their own weight) than solid propellants and are better regulated -- their thrust can be terminated when required. Liquid propellants allow rocket designers a great deal of flexibility, enabling the development of small-thrust engines to 100-tonne- thrust engines, as in the US space shuttle. ISRO obtained liquid engine technology with the help of the French. The Societe Europeenne de Propulsion, Europe's largest producer of liquid propulsion engines, gave ISRO the technology in return for India's help in developing the French liquid engine -- the Viking -- and for the parts it made for the Ariane rocket. This technology has since been indigenised as the 60-tonne-thrust Vikas engine, which is used in the second stage of PSLV. The PSLV is a four-stage vehicle with alternate solid and liquid propulsion modules (See diagram). ISRO scientists explain a multi-stage rocket is advantageous because burnt-out stages can be dropped and the weight-to-fuel ratio can be improved. 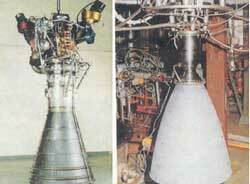 India decided to make a further leap to launching heavy communications satellites by using imported cryogenic engines. Says Srinivas Shetty, former director of ISRO's launch vehicle programme, "Though other options, like using a combination of solid and liquid modules or liquid engines alone, were considered, the use of cryogenic engines was considered most elegant." The GSLV was an improvisation on the PSLV model with its six solid strap-on engines replaced by four liquid strap-ons based on the Vikas engine and the first two stages replaced by a cryogenic engine. Before deciding to import cryogenic engines from Russia, ISRO engineers had played around with smaller cryogenic engines. In the mid-1970s, attempts were made to develop a small semi-cryogenic engine, using specially processed rocket-propellant kerosene and liquid oxygen. But ISRO's emphasis shifted to other areas and, for a while, the cryogenic route was ignored. Cryogenic engines are extremely powerful and utilise as propellants liquified hydrogen and oxygen kept at very low temperatures. H S Mukunda, professor in the department of aerospace engineering at Bangalore's Indian Institute of Science (IISc) says the extremely high specific impulse value of cryogenic liquid propellants enable them to generate a large thrust. However, cryogenic engine technology poses a number of problems, says Mukunda. Cryogenic fuels are explosive and require special storage facilities. If Indian scientists are to develop an indigenous cryogenic engine, they will need to develop expertise in processing and storing the fuel, as ISRO chairperson U R Rao has stated. But Shetty believes these problems can be easily solved. He says ISRO has already set up a liquid hydrogen plant at Mahendragiri (where is this place? ), the site of a liquid propulsion testing system. But several experts admit Indian engineers may be hard-pushed in some areas of cryogenic engine development. One vital component of rocket engines is the special pump to homogenise the fuel mix and spray it into the combustion chamber. The Vikas engine uses a turbo pump, but other liquid engines, like the fourth-stage PSLV engines and the small motor used on the INSAT satellites to nudge them to the exact geosynchronous position, use simpler, pressure-fed systems. Shetty says Indian expertise in pressure-fed systems is considerable. But they are good for only 30-tonne-thrust engines, while turbo pumps are better for high-thrust engines. Small cryogenic engines can be operated using pressure systems, but not large ones. Developing turbo pumps for cryogenic engines would pose a real challenge for Indian engineers, says former ISRO space propulsions systems expert K Anantharam, who has been closely involved in the development of small engines to keep satellites steady. Developing turbo-pump engines would mean designing efficient turbines, suitable bearings and lubrication and fabricating the pump. All these are considered the most difficult technological aspects of liquid engines. However, not all scientists believe that the problem is insurmountable. Engineers at NAL claim to have the basic expertise in developing such complex machinery. Others point out that engineers in the aircraft industry are capable of designing such pumps. Something similar has been used in light combat aircraft being developed by the Bangalore-based Hindustan Aeronautics Ltd. Other parts like thermal sensors, valves, bearings and seals, combustion chambers and nozzles for cryogenic fuels will also have to be developed, virtually from scratch. In 1989, the Liquid Propulsion Systems Centre in Thiruvananthapuram developed another small, semi-cryogenic engine with a one-tonne thrust, which used liquid oxygen and gaseous hydrogen. Recently, it was reported that a one-tonne-thrust cryogenic engine was test-fired, but sources say the test was unsuccessful. Anantharam says developing a 12-tonne-thrust cryogenic engine, like the one Russia was to give ISRO, requires a quantum leap. The engine would require numerous components, some of which are restricted under the Missile Technology Control Regime and will be difficult to import. Some reports indicate Russia has supplied ISRO with about 80 per cent of the drawings relating to cryogenic engine technology. But many scientists warn that the design difficulties ahead are so enormous, it might be better to invest the time and the crores of rupees still to be spent into developing an entirely indigenous cryogenic engine. They note that the Japanese giant Mitsubishi needed a full 10 years to develop an operational cryogenic engine, though having the benefit of US technology under licence. There are also indications that negotiations for the sale of cryogenic engines -- without transferring the technology -- are under way. And, because some Indian scientists are working at Glavkosmos, the Russian space agency, there is optimism that a partial know-how transfer is still possible. But even if India acquires a cryogenic engine, duplicating it will not be easy. One engineer points out how the ASLV project was delayed for more than seven years because of overestimating what appeared to be a simple strap-on technology. "Only when one begins to develop and fabricate a rocket does one encounter the real difficulties," explains one engineer. Without the support of Russian experts, the rocket-building process would take much longer. However, most scientists insist that with a more generous management and the involvement of scientists from other research labs and industry, an indigenous cryogenic engine is a definite possibility. But few are willing to put a date on it. In the interim, most Indian space experts agree, the country will have to continue relying on other countries to launch its communications satellites. Launch services offered by China and Kazakhstan could be explored. One senior scientist who was closely involved with India's technology policies hints India could even reorient its space programme to reduce dependence on cryogenic engines. He argues Indian satellite capabilities are world-class and India should commercially produce and even launch them for other countries. Non-cryogenic technology could also be developed to launch geostationary satellites, but experts say this would result in relatively inelegant, inefficient and less cost-effective systems. Combinations of solid and liquid engines, for which both technology and expertise are available in the country, are feasible. But satellites larger than the INSAT-2 series cannot be launched on such rockets. The PSLV itself can be reprogrammed to deliver geostationary satellites, but such satellites cannot weigh more than 500 kg, severely restricting their utility and life. Few Indian space experts mirror the government's confidence that the country can limit the GSLV delay to no more than two or three years. Their most optimistic assessment is that a fully indigenous launch of a multi-purpose satellite is unlikely before early next century, though ISRO officials insist this can be done by 1997. In the long run, given the geopolitical realities, most scientists feel India must aim at self-reliance. They believe strongly that though India cannot offer commercial launch services as yet, the major space powers fear a potential threat from India and are trying to subvert its space programme. "They will respect us only when we have good technology. This is what we have learnt in our dealings with scientists across the world," explains a top scientist. "Ultimately, we have no option but to develop our own capabilities."